NYC Style Hand Tossed Pizza. Family Owned Since 1980. Paladino’s Pizza has been serving the Syracuse community from Northern Lights plaza since 1980. We are proud to say we celebrated our 35th anniversary in this great city just last year. Paladino’s Pizza was started by Enrica Paladino, and is now owned by her son, Vincent Paladino. The Paladino family moved to Central New York in the late 1970’s from the Bronx, New York. This is where our recipe was first created, giving our pizza that authentic New York City style and flavor. We always appreciate patrons, whether they are locals, or just visiting the area. 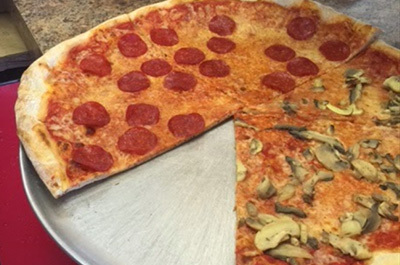 Stop by Northern Lights Plaza today for a slice, or call us and order a pizza to take home to the family! "We LOVE their Pizza and they have been around a long time. It’s a family owned pizza joint. They don't deliver but the great taste is worth driving to pick up." - Gabriel K.
"CXTec crew is loyal to the all mighty Paladino's. I personally grew up on this pizza. No better place in Syracuse to get a pizza. Love their pinwheels. The crew is awesome and our pizza is always a homerun." - Michael P.